Microwriter was not really a computer, but a very original pocket word processing system, designed in 1980 by Endfield Cie in the USA and later manufactured in the UK. It used a keyboard with only 6 keys which made it possible to keyboard all the alphabet letters, numerals and punctuation marks. The typing method used the letters shape likeness and only one hand was necessary to type text. It only required a few hours to get used to keyboard and then typing speed could be very fast. 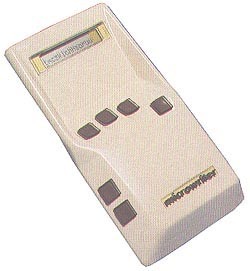 The internal design of MicroWriter was similar to a pocket calculator with low power components and rechargeable batteries ensuring a 30 hours autonomy. The 14 character LCD display allowed horizontal text scrolling. Several editing controls made it possible to correct, remove, add and move text. The integral word processing software could connect directly to a printer and did formatting. It also allowed to upload/download documents to a computer via that same serial port. Microwriter could be also connected to a video monitor via an external unit, and an acoustic modem. The text could be recorded as well on tape. The original concept of Microwriter did not meet much success, and distribution stopped in 1985, though the keyboard was subsequently used on the AgendA (1988-93) and still available for PC & Palm as the CyKey from Bellaire Electronics. It is much more interesting, perhaps, than you suggest. The inventor was Cy Enfield. He was blacklisted in America in the film industry and went to Britain. He wrote the script for Zulu Dawn about 1969 and then wrote, produced and directed Zulu in 1964. That starred Jack Hawkins, Michael Caine (at his very best) and Stanley Baker. The narrration, incidentally, was by Richard Burton so we are talking a class act. I never met Cy Enflield but I met his daughter several times in London. While working on the script of Zulu Dawn and later on Zulu he had the idea of a one handed keyboard. He designed it, it was produced and I bought one. It was indeed called the Microwriter. It had five buttons on the top and you pressed them in sequence. I could write articles with the machine while driving and then sling the result down through a serial port into my computer for editing. The reason it did not sell is that it simply was very, very slow. There is a lot of current research into similar machines. And they won't work either. Speed and convenience is what you need and such devices provide neither. The MicroWriter was actually developed by a company called Bellaire electronics... Their other product is called a CyKey, which allowed people to use the MicroWriting system as a keyboard on their PCs. The original model - Model CK A 1.1 - only used a 5-pinny outlet for the BBC Micro computer, however newer models allow you to use it with Microsoft Operating Systems. I was National Information Officer for the Microelectronics Education Programme during the early 1980s. All directorate staff used the Microwriter to compose all correspondence. We travelled with the machines as we visited the 14 regional information centres on a regular basis. On such long trips we could write on the train or whilst sitting in airports. It was mindbending to learn, but after 7 days we were each very competent and thought it a marvellous machine. I still have mine. I was once surrounded by some aggressive young people whilst travelling alone in a first class compartment, and I defused their threatening behaviour by teaching them how to use the machine. RAM 8 Kb. expandable to 16 Kb. POWER SUPPLY Rechargeable batteries or external P.S.U. see more Microwriter Microwriter Ebay auctions !